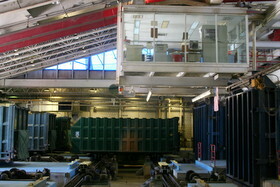 Control room of Roosevelt Island trash collection system. The solution to noisy, diesel-burning garbage trucks hauling away waste in New York City may lie under the pavement and over the heads of city residents, two new studies suggest. The University Transportation Research Center (UTRC) at The City College of New York produced the reports. They show the benefits of expanding an existing underground pneumatic garbage disposal system on Roosevelt Island and creating new networks in Manhattan by making use of such existing transportation infrastructure as the Second Avenue subway and the High Line Park viaduct. The New York State Energy Research and Development Authority (NYSERDA) and New York State Department of Transportation (NYSDOT) funded the studies through a program that explores techniques to reduce transportation-related fossil fuel use. Pneumatic collection uses negative air pressure to pull solid waste through a network of pipes to a central collection point. There, it is compacted and sealed into containers for transport to a processing or disposal facility. It is not a new idea: the technology has been used successfully in Europe and Asia for more than 50 years. Since 1975, such a system has collected residential trash on Roosevelt Island. The studies found energy and environmental savings associated with proposals for two new pneumatic facilities that would be installed under the High Line and in the Second Avenue subway. The systems would also improve quality of life and public health by reducing the amount of waste collected from sidewalks. Upgrading the existing system on Roosevelt Island could eliminate trucks that are currently used to collect the island’s recyclables, commercial waste and litter bin waste. "Governor Cuomo has made innovation a cornerstone to stimulating the economy and creating green jobs. NYSERDA is pleased to once again partner with the Department of Transportation on a project which offers potential solutions to emissions reduction in the transportation sector," said Janet Joseph, NYSERDA vice president for technology and strategic planning. "The state’s investment in such studies demonstrates its commitment to expanding a clean energy economy that can support the technologies of tomorrow." Benjamin Miller, senior research associate, freight programs, bmiller@utrc2.org, 212-316-5045. The University Transportation Research Center (UTRC) is a U.S. Department of Transportation Regional Transportation Center addressing surface transportation operations, management, design economics and planning. The Region 2 University Transportation Research Center is one of ten original National Centers, established in 1987, in recognition that transportation plays a key role in the nation’s economy and in the quality of people’s lives. Located at The City College of New York, the Center is a consortium of 17 major academic institutions in New York, New Jersey, and Puerto Rico. Through the grant supporting the Center, the mission incorporates research, education and the transfer of technology in the field of transportation. Academically based, the work of faculty and students – graduate and undergraduate — provides a critical link in resolving our national and regional transportation problems while training the future and current professionals who address our transportation system and their customers on a daily basis. For more information, visit www.utrc2.org. Since 1847, The City College of New York has provided low-cost, high-quality education for New Yorkers in a wide variety of disciplines. More than 16,000 students pursue undergraduate and graduate degrees in: the College of Liberal Arts and Sciences; the Bernard and Anne Spitzer School of Architecture; the School of Education; the Grove School of Engineering; the Sophie Davis School of Biomedical Education, and the Colin L. Powell School for Civic and Global Leadership. Set on a striking, 35-acre hilltop campus in upper Manhattan, CCNY has produced more Nobel laureates than any other public institution in the United States. The College has been touted as one of America's Top Colleges by Forbes, one of the Best Colleges in the United States as well as one of the Best Value Colleges by the Princeton Review, and ranks among U.S. News’ top regional universities.